Within Teamwork Desk you can change the settings for your Help Docs site. It allows you to create new articles and categories. There is no limit to the number of sites you can have in the Help Docs section. Note: Only administrators can manage help docs on your account however this does not limit an agent’s ability to update or create new Docs. To create a help docs site, click on your profile icon to the top right of the navigation bar and select Settings. 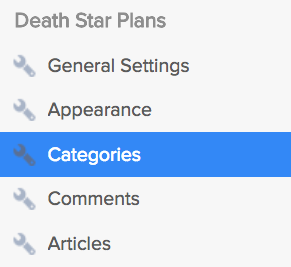 In the settings area, go to the Help Docs tab. 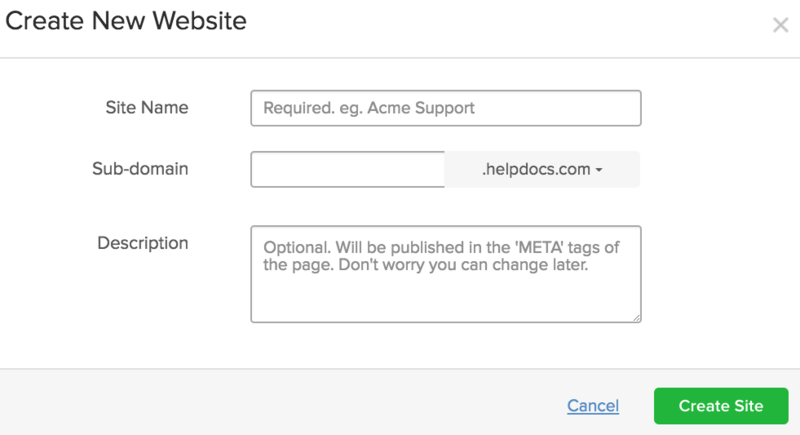 To the center of the page you will see an option to add your first help doc site. Select Add your first help site and enter your details as below. Once created you will have various settings areas within the left pane. You can enable a contact form for your site and when enabled choose which inbox your customer emails go to. Select the color theme for your site. Make it your own, enter templates for Headers, Footers and more. If you wish to upload a style sheet or Insert Head code for your Docs site. Set up your own category structure, we do support nesting of up to three levels here. You can support comments via Disqus and you can visit Disqus directly from your this comments area. This will list all the articles that you have currently created for this site.